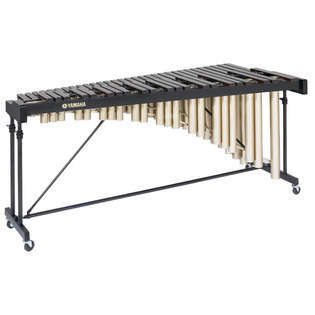 Yamaha YM1430C 4.3 Octave Padouk Standard marimba with A25-C76 range, two-position resonator slots, height adjustable angle supports and essential accidental resonators. Includes Cover. Yamaha exclusive tuning method ensures true pitch and full sound. Padouk wood bars provide natural wood sound and feel. Graduated bars produce full tone and projection throughout the instrument's range. The cut-away resonator design with only essential accidental resonators reduces overall size and weight of the instrument for ease of transport and storage. 2-position resonator tracking system allows two resonator height settings for pitch and tone control in varying climate conditions. Height adjustable frame allows most comfortable playing position for all players. Durable frame has lower crossbar support, and two angle braces maintain stability, and, therefore, playability of the instrument. Locking casters on player side are easy to reach and secure the instrument during playing. Bar sizes: Graduated; 1 1/2" - 2 1/4" x 7/8" - 1"
Frame: Height adjustable from 34 5/8" to 38 5/8"
I love this marimba and I'm very happy to own it. First thing's first, it's not rosewood and it doesn't sound like rosewood. It resonates less and the sound tends to lack some lower partials, while some nice rosewood marimbas I've used sound very deep and resonant. That being said, I love the fact that it sounds like WOOD. Padouk sounds better than synthetic bars, hands down. And it costs less! Rosewood sounds better than both, of course, but assuming you aren't a professional marimbist and you can't justify spending 10k+ on a 5 octave rosewood marimba, this is the keyboard for you. I don't think it's worth getting anything less than a 4.3. You can still play some solos on 4.3s, and most 5 octave solos can be revoiced to work. But don't buy anything less than a 4.3 if you want to do any serious solos. Also, for those tied between the Adam's 4.3 and this Yamaha, I am of the opinion that this one sounds better. I've played an Adam's padouk marimba at PASIC 2013, and I wasn't a big fan of the sound. It was less resonant than this marimba. But of course, there is a price difference that has to be taken into consideration. Anyways, this is a great marimba and I love it. Padouk gets such bad rap but it's a great material, and I much prefer it to synthetic. We wanted to get a good quality marimba for a relatively new but serious percussion student, and not spend a mint. We are very pleased with the Yamaha Padouk 4.3 octave instrument, which his teacher recommended. In addition to being very nice to look at, it is sturdy and has a beautiful sound. This marimba is definitely a good value. Also, the packaging was superior, and everything arrived in perfect condition. This is not a top-end professional keyboard. However, for any student practicing in cramped quarters, any school program that needs highly portable concert marimbas, and anyone willing to put up a little more money than a "table top" keyboard will cost, this a really great investment. I recommend them to all my students. Also, if you outgrow it, you can sell it WAY easier because it is fully functional and not just for practice. This Yamaha marimba is really nice, the only thing is the bars on this model aren't as wide so intervals are kinda off. I know this for fact I have compared the 1430 and the 5100 bar size, but I am satisfied none the less!